Former Vice President Joe Biden joined Democrats Monday in calling on the Senate Judiciary Committee to delay a confirmation vote on Supreme Court nominee Brett Kavanaugh following recent allegations of sexual assault. Why it matters: Biden has thrust himself into a national debate that resembles a similar event from when he presided over the confirmation of Clarence Thomas to the Supreme Court in 1991. Thomas, too, was accused of sexual assault — but by his former employee, Anita Hill. "He believes the vote should be postponed to allow this to happen appropriately, because this is an appointment for life to the nation's highest court, and getting the decision right is more important than getting it done on a rushed timeline." 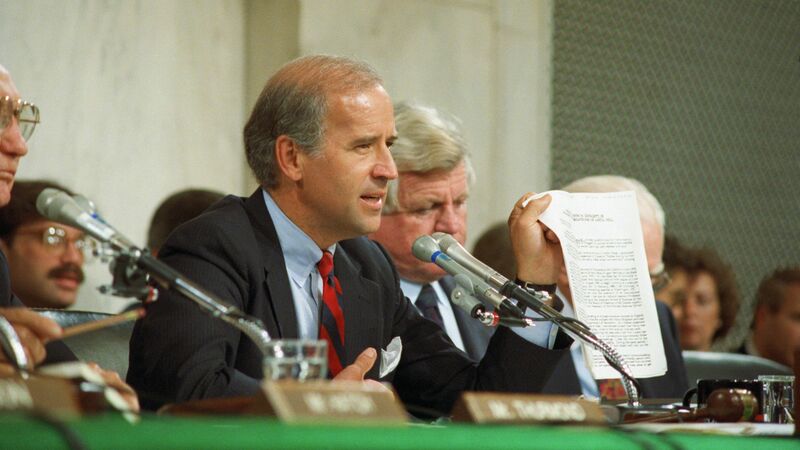 The backstory: Biden, then chairman of the Senate Judiciary Committee, has been harshly criticized for his handling of Thomas' confirmation process. The all-male Senate Judiciary Committee grilled Hill, a Oklahoma University law professor, when she testified that Thomas made unwanted sexual advances toward her while working for him at the U.S. Department of Education and the Equal Employment Opportunity Commission. The committee casted doubts on her testimony, and Thomas denied the allegations. Even though Biden ultimately voted against Thomas, who was confirmed to the nation’s high court, reports said he did little to defuse the intense questioning and temper in the room. Biden also said he "owes her an apology.” His team told CNN on Monday that he and Hill have not talked.